Please Note - Sinks and taps are not included. This stunning Pavillion grey vanity unit has been toped with white quartz and finished with brushed chrome door knobs. All our vanity units are built to bespoke sizes to suit your individual bathroom requirements. Handmade in Yorkshire from the finest materials, you can be assured that a vanity unit from Aspenn furniture is built to last! 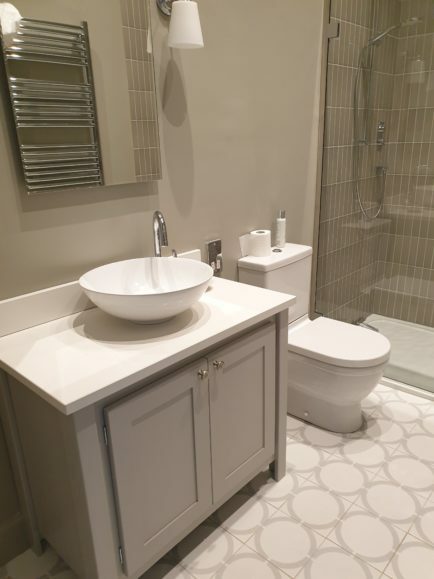 We can design a completely custom vanity unit to fit the space, look and feel you require. All of our vanity units are hand made in Yorkshire and delivered personally to your home by us.